The regatta was conducted from 21st to 24th July 2005. This was the first to have the title of Championship and the large entry showed that countries would send crews in these circumstances. The Australian U23 team faced tough competition at these Championships and managed to take home two medals. "We are extremely pleased with the development opportunity this regatta has given our team members". This under 23 team was one of the biggest Australia has ever sent to this competition. It was an indication of the need to develop young athletes with potential for 2008 Bejing Games. As financial support for this team is limited, considerable strain will be placed on the participants, clubs and institutes to meet the commitments. Final selection took place at the Sydney International Regatta Centre on the week of 9-15 April 2005 in conjunction with the open selections. It was an exhausting week for those boats where selections were tight and extensive seat racing was required. Tara Kelly (QLD) and Anna McRae (SA), coached by Lincoln Handley, took on a tough field in the Women's Double Scull and overcame crews from Lithuania and the United States to win the silver medal behind Italy. The achievements of the crew highlighted the benefits of racing in the Lucerne World Cup in June. The Australian women were successful in securing a second podium finish, when Jess Huston (WA) and Alice McNamara (VIC) placed third in the Women's Lightweight Double Scull. 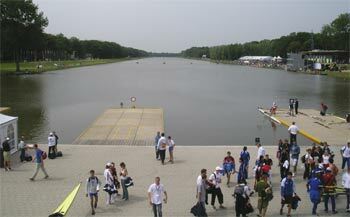 The crew was coached to the bronze medal position by Tim Dolphin. Team member Chris Riddell reported: The heavy quad was based in WA and were race ready at the first team camp in Canberra. The Italian inspired preparation had them rating 39 in Canberra. The interstaters didn't get to go home from the camp in Canberra and they returned to WA for more training in the few days before we left to go overseas. Overseas they were very competitive in Lucerne against the open crews. The training and continued racing in Tilburg was the first taper for the boys who found more energy and speed as they moved to Amsterdam. Eventually they came ninth. Crew member Chris Riddell reported: The men's eight all lived in Sydney at the Sydney Grammar Boat Shed and trained on the Parramatta River. The crew had a few bouts of sickness as the training took its toll at their first camp in Canberra. From their first competitive racing in Canberra they crew learnt a lot and went overseas looking forward to the challenge. Racing the open crews in Lucerne indicated that the start needed improvement and the training in Tilburg really sharpened them up as they headed to Amsterdam. In Amsterdam they camp eight overall. Team member Chris Riddell reports: The lighty men's quad included 2004's lighty double of Howard Sharp and Chris Ritchie, Cade Zulsdorf from WA and also Hugh McLeod from Newcastle, the first 'Novacastrian' to make a national team in decades. All the boys moved to the AIS to train on Lake Burley Griffin throughout the winter. Their first competitive racing at the National Camp in Canberra was fruitful as they found some racing speed. The trip overseas was well handled as they had plenty of experience. Lucerne was a serious challenge as the other quads were racing for spots in the final straight up. Their training in Tilburg was tough as they continued a power-stroke workload throughout their stay. As their taper continued they found more speed and raced well in Amsterdam to finally come fifth. Team member Chris Riddell reported: The four trained in Canberra so they two Victorian boys moved to the AIS, but the crew trained out of ACTAS. The crew was lead by Josh Fahy who stroked the Victorian Penrith Cup crew and had previously rowed for Australia. Coached by 'A Mac', one of the real personalities of the tour, the crew's preparation was hampered by some injury problems. Their racing at the team camp, Lucerne and the competitive environment at Tilburg, the crew rose again. Overall they finished ninth. Team member Chris Riddell reported: These girls trained really well and improved dramatically from selection to the training camp held in Canberra. The crew contained Anna McRae was very experienced after winning a bronze last year in the same event. They like every other crew learnt a lot from Lucerne and stepped up during the training camp. In Amsterdam they raced extremely well and they came second which was the team's best result. Team member Chris Riddell reported: With the three Brown sisters in QLD, Lisa Szatsnadjer moved to Queensland to train. The girls trained extremely hard with ergo's most days and serious volume. At the Canberra camp they had some seating changes. The Lucerne experience was all positive for them as they stepped up to the challenge. During the training camp in Tilburg, their training efforts were seriously hampered by illness but were back on track by the time that they arrived in Amsterdam where they finished third in the B final. Team member Chris Riddell reported: Alice and Sassi had won selection trials and were clearly the fastest under 23 women's pair all season. They trained hard at home in Melbourne but did suffer some injury troubles both during training at home and overseas. During the tour, their racing and boat speed improved well. Despite some injury interruption whilst training in Tilburg, when they arrived in Amsterdam they really stepped up, eventually finishing seventh. Team member Chris Riddell reported: This crew trained in Canberra with Annika and Katelyn from WA and Sydney respectively living with the two Canberra girls. They made it through training in the below zero mornings of the Canberra winter to become some of the toughest girls on the trip. They only had one race in Lucerne, but the training in Lucerne really sharpened them up. This left them well prepared for Amsterdam where they finished sixth. Team member Chris Riddell reported: The lightweight double trained in Melbourne, and their coach Tim Dolphin organised a lot of training with the women's pair under coach John Acton to give them plenty of competitive training. At the training camp in Canberra they fought hard in racing against the Junior and Under 23 heavy doubles, for their first serious racing. In Lucerne they learnt a lot from racing against the open crews. They were very fast, especially in the first 500m and beat many of them out. During training in Tilburg they polished their middle thousand, and did extremely well in Amsterdam coming third.